1. Why should you buy a titanium wedding ring? Titanium wedding rings combine beauty and strength, but are light weight. If you want your wedding ring to last a lifetime, then you will definitely need a ring that is strong. The strength and hardness helps to prevent scratches and dings. But if you are like most people, you probably want it light enough that you do not mind wearing it all the time. Despite its hardness, titanium wedding rings are surprisingly light weight. Lastly, you will be amazed at the comments you will receive about your titanium wedding ring's simplicity and beauty. 2. What is the best way to buy titanium wedding rings? When selecting a titanium wedding ring, be sure to take into account the finger size and shape of your fiancée's ring finger. Whether you plan on buying a ring at a brick and mortar store or at an online retailer, you should at least visit a brick and mortar store to have your ring finger sized properly. If you and your fiancée plan on getting matching titanium wedding rings, make sure that the design fits the shape of both of your ring fingers and that you both agree on the design. Most importantly, you will want to deal with a reputable jeweler that will be there for you over the years to resize and polish the ring. You do not want to deal with a fly by night jeweler who will not be around in a year. You can search for reviews online or ask for recommendations from your friends and family that live in the same area as you. 3. Can you get titanium wedding rings in different colors? Yes, you get titanium wedding rings in different colors. Titanium wedding rings are considered a white metal, similar to platinum, with a grayish undertone. 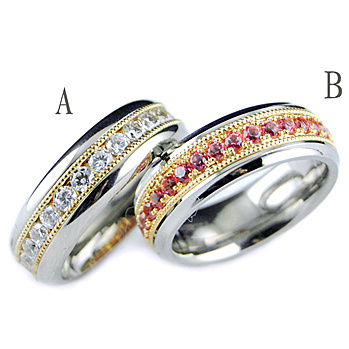 In order to add color, the ring must be anodized with a color treatment. However, it is important to not that the color treatment is not permanent and can make the titanium wedding ring appear scratched and discolored over time. 4. Can you get wedding rings with titanium that also have other precious metals in them? Absolutely! If you like a little more variety in the titanium wedding ring you will be wearing every day, you can request the ring be combined with yellow, rose or white gold. Some people even choose to have titanium and platinum wedding rings created. Just depends on your preference. 5. How can you determine the quality of your titanium wedding ring? As with any precious metal, you can either choose to have a pure titanium wedding ring made or go for an alloyed titanium wedding ring that contains a mixture of metals. Most reputable jewelers will let you know what the commercially pure (CP) grade of their titanium rings are. If they do not, you should definitely ask! CP grades range from 1 which is the softest to 4 which is the hardest. The most common CP grade for titanium rings is CP2 because it balances the ability to have a harder titanium wedding ring but is still soft enough to be etched and engraved.